Nike has announced the first ever pair of real sneakers earned by playing a video game. 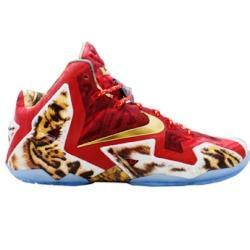 The company has revealed the Lebron11 basketball shoes, which required approximately 80 hours of NBA 2K14 play and specific milestones in order to unlock. If you happen to be one of the lucky 2,014 players, please let us know when you get your Lebron11s. We’d love to see you modeling them.